These questions have been much discussed both in recent philosophy and by scholars grappling with the work of the enigmatic 19th-century thinker Søren Kierkegaard. For the first time, this collection brings together figures in both contemporary philosophy and Kierkegaard studies to explore pressing issues in the philosophy of personal identity and moral psychology. 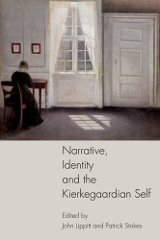 It serves both to advance important ongoing discussions of selfhood and to explore the light that, 200 years after his birth, Kierkegaard is still able to shed on contemporary problems. Contributors: Roman Altshuler, Kathy Behrendt, Matias Møl Dalsgaard, John J. Davenport, Eleanor Helms, John Lippitt, George Pattison, Anthony Rudd, Michael J. Sigrist, Marya Schechtman, Patrick Stokes, Michael Strawser, and Walter Wietzke.